Plenty of coverage of writer/director Mike Mills’ Beginners has focused on how the filmmaker’s past influenced the story. In its execution, it seems to have been influenced just as much by his present. It’s been well documented that the basic plot setup came from Mills’ own experience. 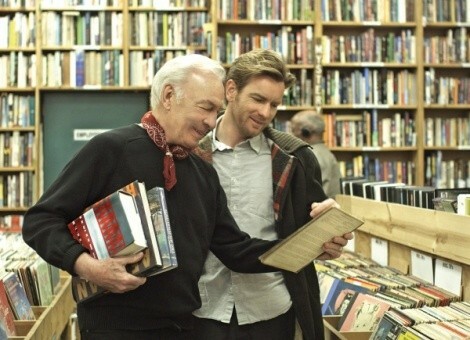 His stand-in here, Oliver Fields (Ewan McGregor), is clearing out the home of his recently deceased father, Hal (Christopher Plummer); in flashbacks, we learn that the widowed, septuagenarian Hal informed Oliver only a few years before his death that he was gay. The narrative then proceeds to snap back and forth in time between Oliver’s relationship with his newly out dad and his budding romance after his death with a French actress named Anna (Mélanie Laurent). Mills is married to artist/filmmaker Miranda July (Me and You and Everyone We Know), and it’s hard not to spot some of her influence on some of Beginners’ stylistic quirks. Anna is suffering from a bout of laryngitis when she and Oliver first meet—at a costume party, no less—forcing communication by handwritten notes. The barking of the neurotic dog Oliver inherits from Hal is occasionally translated into on-screen captions. We see multiple variations on Oliver’s recollection of Hal’s “I’m gay” announcement indicating his unreliable memory. The needle on the preciousness meter comes perilously close to the red zone. Yet Beginners remains anchored in a sincere humanity, thanks largely to the performances. McGregor does strong work as a guy who isn’t even pretending to have a grasp of intimacy, but Plummer nails the newfound exuberance in Hal’s exploration of his true self. Mills pulls off the rare trick of making terminal illness part of a storyline without ever dipping into maudlin melodrama, because Hal is too focused on the joys of his second chance at love. The result is something with a truly distinctive tone: a drama that wears both its emotions and its kookiness on its sleeve.